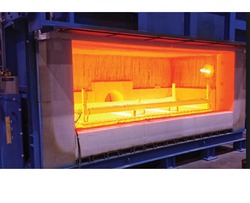 We are leading Manufacturers of Forging & Heat Treatment Furnaces. Furnaces under the name of RADIAL ENGINEERS which is our Parent Company. We are leading Manufacturers of Forging & Heat Treatment Furnaces. We are well established for the past 30 Years. We Manufacture thse Furnaces under the name of RADIAL ENGINEERS which is our Parent Company. Shekhar Hearth Furnace with working condition but dis-mental for future expansation. Full Set is available. Owing to the immense experience and a competent team of experts, we are able to offer Bogie Hearth Furnace to our customers. As per the varying requisites of our customers, we are engrossed in bringing forth a world class consignment of Rotary Hearth. Widely acclaimed owing to their reliability, these are massively accepted. Also, these are offered at most reasonable rates. Aichelin Unitherm Heat Treatment Systems (I) Pvt. 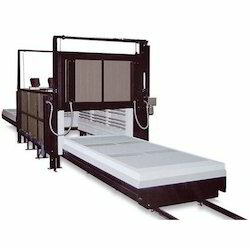 Ltd.
We offer a wide range of Bogie Hearth Furnace. It is used for heat treatment of heavy jobs. Bogie Hearth Furnaces or Car Bottom Furnaces are available with motorized bogies for easy loading and unloading. These can be used for annealing, normalizing, hardening, stress relieving and tempering. Furnaces upto temperatures of 1500°C can be designed and manufactured as per application. Ipsen's RHF is designed for both carburizing shallow case depths and reheating pretreated work pieces. Its high throughput makes it particularly suitable for heat treating large quantities. To furnish the diverse requirements of our clients in the best possible manner we are involved in offering an extensive range of Bogie Furnace. One Pit Type Gas Carburizing furnace of 1500 Kgs gross capacity (size:1300mm × H1800mm) and One Shaker Hearth Furnace for Parts like Fasteners, Washers, Small Shafts, Rollers, Pins, Nuts, Precision Spring Steel material. This robust furnace type is extremely versatile. It is designed for both carburizing shallow case depths and reheating pretreated work pieces. Its high throughput makes it particularly suitable for heat treating large quantities of the same parts.